Australia batsman Ricky Ponting will be given chance to improve his form before the Ashes, says coach Mickey Arthur. The former captain has scored only 20 runs in his last three innings and fears he will miss out on the 2013 tour of England. But Arthur said: "At the moment, Ricky has the unanimous backing of the selection panel. We want him to go to the Ashes, there is no doubt. "If Ricky misses out in Perth I think that will be it; Australia will look to move forward for the Sri Lanka series. All Australian fans will want to see him carry on and I know he desperately wants to play in the Ashes. I wouldn't write him off." "We want him certainly around for the next six months." Ponting was in impressive form for state side Tasmania before the current Test series with South Africa, registering successive first-class scores of 85 not out, 162 not out and 60 not out in the Sheffield Shield. However, the 37-year-old has struggled against the Proteas and, in the first innings of the drawn second match at Adelaide, ended up lying flat on the wicket after being bowled by Jacques Kallis. "I live in the real world and I know that if I'm not making runs I might not see the summer out, so I definitely won't be in England," said the former captain, who has scored an Australia record 13,366 runs in 167 Tests. But with Ponting retaining his place for the deciding third Test at the Waca, Arthur supported the right-hander, saying: "By his own admission Perth is a big Test for him, but Ricky's prepared brilliantly. "He will leave no stone unturned in his preparation going into Perth and I'm backing him for a big score." 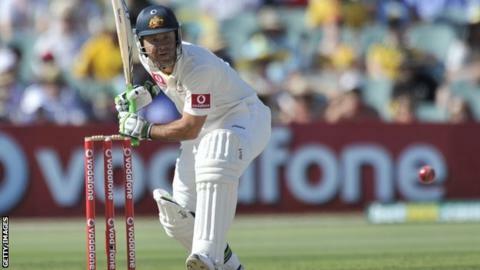 A trip to England in 2013 would be Ponting's fifth Ashes tour and would provide the opportunity to make amends for 2005 and 2009, when he was the losing skipper. Australia will replace South Africa at the top of the world Test rankings with victory in Perth. The Baggy Greens also host Sri Lanka for three Tests and tour India before making the trip to England.